When the temperature drops, there's nothing worse than your pipes freezing, leaking or bursting, or worse... your boiler failing. To help ensure your home remains warm and free from pipe problems throughout periods of cold weather, check out our top tips below. Check for any dripping overflows from loft tanks and toilets, or safety pipes from your boiler. Be sure to get any drips or leaks sorted as soon as possible. Not only can they be costly on your water bill and waste water, the puddle created from a continuous drip or leak could freeze in the cold weather, resulting in nasty slips and falls. It's a good idea to keep your heating on low at night during periods of very cold weather. About 14/15 degrees should keep water circulating in your pipes. If you’re going to be away for a while, let our Homefix team know and we'll turn off your water supply and drain the system down. Know where your stop tap is! Should an emergency occur, you'll need to turn the water off quickly. You’ll usually find your stop tap under the sink, however it can also be in an airing cupboard, under the stairs or near the front door. Make sure the stop tap is easily accessible and that it works. If working correctly, you should be able to turn the stop tap clockwise without any problem. Minimise draughts and shut doors and windows to unheated parts of your home. Where possible, check for any exposed or unheated water tanks and pipes. If you're concerned about any pipes in your home, give the Homefix team a call on 01403 226000 or log into your My SaxonWeald account to raise a repair. If your pipe has burst and is easy and safe to access, try and bind it tightly with a cloth or tape as a temporary fix. If you find your boiler making a gurgling noise and your heating not working, there is a good chance your condensate pipe might have frozen. Condensing boilers are highly efficient, and they achieve this efficiency by extracting as much heat as possible from waste flue gases. When a condensing boiler is operating efficiently, it can provide up to 2 litres of condensate an hour. The condensate pipe is a white pipe that comes out from your boiler and travels to the external waste water, drainage system or soakaway in the ground outside of your home. Where possible, the pipe will be run internally to avoid being exposed to cold external temperatures. If an internal route is not possible, the condensate pipe is run externally. During prolonged periods of freezing weather, it is possible for the pipe to freeze and affect the operation of your boiler. How can I help to prevent my condensate pipe freezing? How can I safely thaw a frozen condensate pipe? If your condensate pipe freezes, don't panic - you can usually thaw it safely yourself. Look for an outdoor pipe (usually a white plastic pipe similar to a waste pipe) which is connected to your boiler. (not boiling) along the length of the pipe. Alternatively, you can use a hot water bottle or heat pad on the sections of pipe you think are frozen. Reset your boiler. If the pipe has defrosted, your boiler should begin to work as normal. 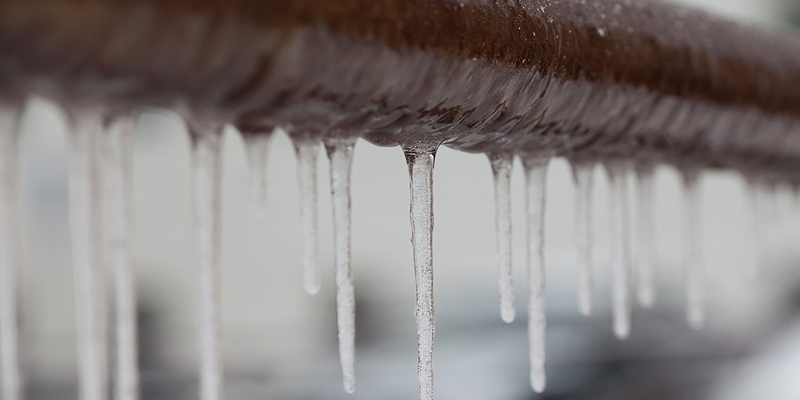 When thawing external pipes during periods of very cold weather, be especially careful carrying hot water. Any water you spill on the ground is likely to freeze, creating new icy patches which could cause a safety hazard for you and others around you. We hope that these useful steps will help you prevent or resolve any issues you have with frozen pipes in your home. However, if you require assistance, please call Homefix on 01403 226000 or log into your My SaxonWeald account to raise a repair.